What determines how much we fear something? Is it based on the actual risks posed? Or do our emotions lead us to fear the wrong things and weigh risks differently than we should? Interesting piece comparing the relative risks of swimming pools and guns and how much we fear each. 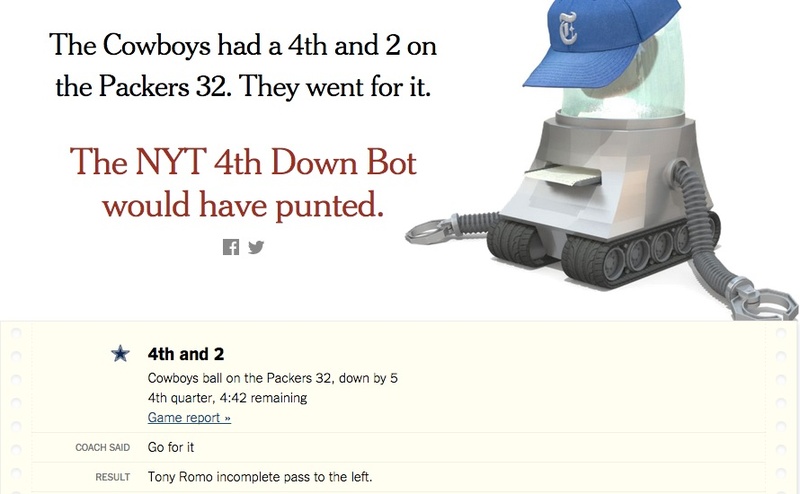 This is a clever program that does an analysis of every 4th down play in every professional football game. It determines based on mathematical expected value whether teams should go for it, punt, or kick a field goal. It breaks down the math behind its decision making. What’s interesting is how often the mathematical decisions are not the ones followed by the people on the field. Who is right in a case like this? What happens when the “common sense” approach is different from the mathematically “true” approach? An essay that summarizes the ideas in the book Descartes’ Error discussing the relationship between emotion and reason in human decision making. There is an age old debate about the roles of emotion and reason in our decision making. Are decision made free from emotion better? Are they possible? The conventional views have been to try to disregard emotion when making decisions but there is interesting research that disputes these ideas. Below are some interesting articles discussing these issues. See a contrasting view by checking out Plato’s allegory of the chariot.